We are inviting you to our NEW home COMuseum.com in 10 seconds! 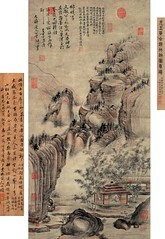 The history of Chinese painting can be compared to a symphony. The styles and traditions in figure, landscape, and bird-and-flower painting have formed themes that continue to blend to this day into a single piece of music. Painters through the ages have made up this "orchestra," composing and performing many movements and variations within this tradition. It was from the Six Dynasties (222-589) to the Tang dynasty (618-907) that the foundations of figure painting were gradually established by such major artists as Gu Kaizhi (顧愷之) and Wu Daozi (吳道子). Modes of landscape painting then took shape in the Five Dynasties period (907-960) with variations based on geographic distinctions. 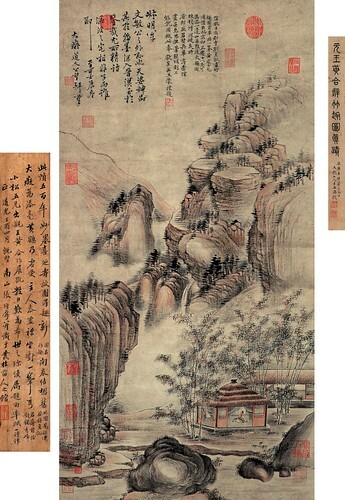 For example, Jing Hao (荊浩) and Guan Tong (關仝) depicted the drier and monumental peaks to the north while Dong Yuan (董源) and Juran (巨然) represented the lush and rolling hills to the south in Jiangnan (south of the Yangtze River). In bird-and-flower painting, the noble Tang court manner was passed down in Sichuan through Huang Quan (黃筌)'s style, which contrasts with that of Xu Xi (徐熙) in the Jiangnan area. 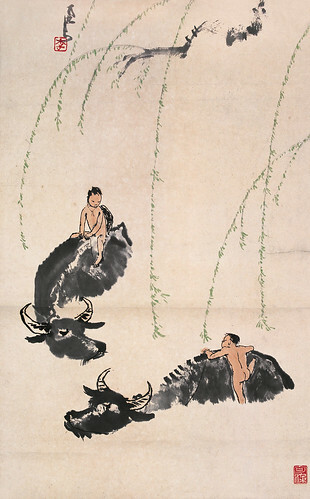 In the Song dynasty (960-1279), landscape painters such as Fan Kuan (范寬), Guo Xi (郭熙), and Li Tang (李唐) created new manners based on previous traditions. Guided by the taste of the emperors, especially Zhao Ji (趙佶), painters at the court academy focused on observing nature combined with "poetic sentiment" to reinforce the expression of both subject and artist. 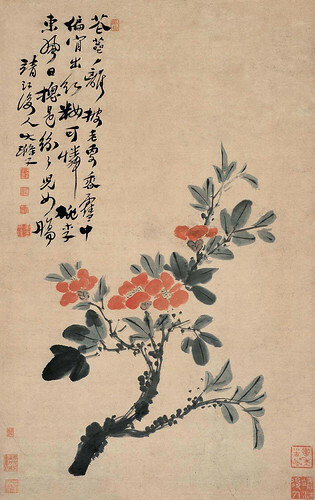 The focus on poetic sentiment led to the combination of painting, poetry, and calligraphy (the "Three Perfections") in the same work (often as an album leaf or fan) by the Southern Song (1127-1279). Scholars earlier in the Northern Song (960-1126) thought that painting as an art had to go beyond just the "appearance of forms" in order to express the ideas and cultivation of the artist. This became the foundation of the movement known as literati (scholar) painting. The goal of literati painters in the Yuan dynasty (1271-1368), including Zhao Mengfu (趙孟頫) and the Four Yuan Masters, namely Huang Gongwang (黃公望), Wu Zhen (吳鎮), Ni Zan (倪瓚), and Wang Meng (王蒙), was in part to revive the antiquity of the Tang and Northern Song as a starting point for personal expression. This variation on revivalism transformed these old "melodies" into new and personal tunes, some of which gradually developed into important traditions of their own in the Ming and Qing dynasties. 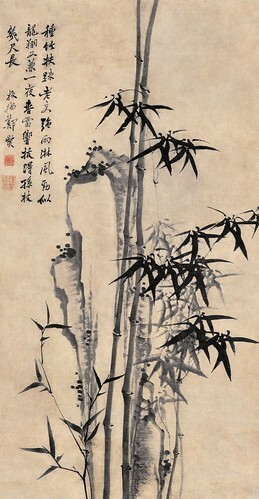 As in poetry and calligraphy, the focus on personal cultivation became an integral part of expression in painting. Starting from the Ming dynasty (1368-1644), painting often became distinguished into local schools that formed important clusters in the history of art. 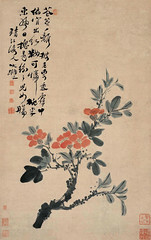 The styles of "Wu School" artists led by Shen Zhou (沈周) in the Suzhou area, for example, were based on the cultivated approaches of scholar painting by the Four Yuan Masters. 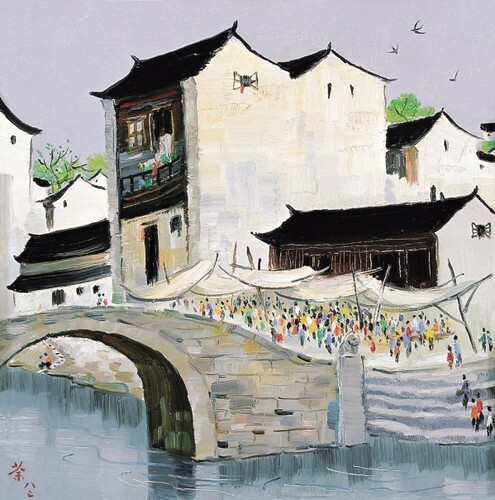 The "Zhe School" led by Dai Jin (戴進) consisted mostly of painters from the Zhejiang and Fujian areas; also active at court, they created a direct and liberated manner of monochrome ink painting based on Southern Song models. The late Ming master Dong Qichang (董其昌) from Songjiang and the Four Wangs, namely Wang Shimin (王時敏), Wang Jian (王鑑), Wang Hui (王翬), and Wang Yuanqi (王原祁) of the early Qing dynasty (1644-1911) adopted the lofty literati goal of unifying certain ancient styles into a "grand synthesis" so that all in mind and nature could be rendered with brush and ink. 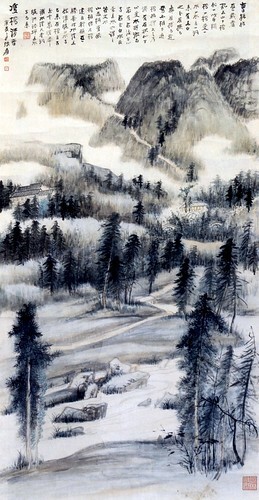 The result was the vastly influential "Orthodox School", which was supported by the Manchu Qing emperors and was in contrast to a group of Individualist painters, mainly Zhu Da (朱耷) and Shitao (石濤). The court also took an interest in Western painting techniques (brought by European missionaries) that involved volume and perspective, which became known to and used by some Chinese painters to create a fused style. 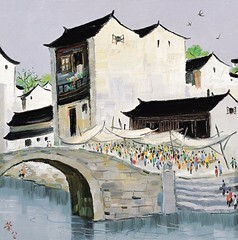 Outside the court, the major commercial city of Yangzhou in Jiangsu developed the trend toward individualism to become a center for "eccentric" yet professional painters, such as Zheng Xie (鄭燮). It also spread to Shanghai, where the styles of artists like Ren Bonian (任伯年) and Wu Changshuo (吳昌碩) were also inspired by "non-orthodox" manners, which themselves became models for later artists, for example Qi Baishi (齊白石). Thus, throughout the ages, a hallmark of Chinese painting has been the pursuit of individuality and innovation within the framework of one's "symphonic" heritage. The painting galleries at China Online Museum represent a selection of individual "performances" in order to provide an overview of some major traditions and movements in Chinese painting.